The inherent variability of cases in legal practice in the domain of private law places important constraints on the conclusions to be drawn from observations from actual litigation. Simply put, cases in the domain of private law vary with regard to numerous features (for example, nature of harm, liability standard, level of fault, claims, awards, features of the litigants, and so forth) that may impact the processes that occur within them, yet whose unique contributions to these outcomes are impossible to separate. 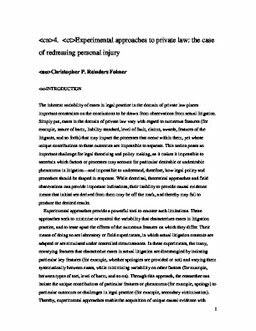 This notion poses an important challenge for legal theorizing and policy making, as it makes it impossible to ascertain which factors or processes may account for particular desirable or undesirable phenomena in litigation—and impossible to understand, therefore, how legal policy and procedure should be shaped in response. While doctrinal, theoretical approaches and field observations can provide important indications, their inability to provide causal evidence means that initiatives derived from them may be off the mark, and thereby may fail to produce the desired results.